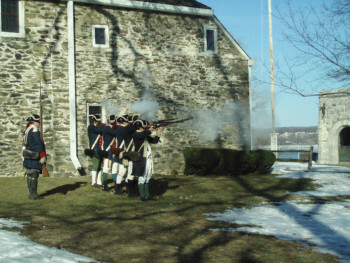 There are plenty of attractions in Newburgh, NY, including Washington’s Headquarters State Historic Site. 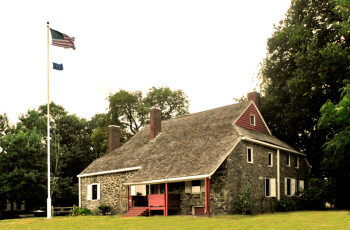 This was the nation’s first publicly owned historic site, and it hearkens back to the days when the country itself was being forged during the Revolutionary War. Situated just alongside the Newburgh Waterfront, the site forms one of the area’s most impressive attractions. Though the house itself — previously named Hasbrouck House — was built in 1725, it wasn’t until Sunday, March 31, 1782 that Washington himself took up residence. The property’s position overlooking the Hudson River gave Washington a strategic advantage and allowed him to retain control of West Point. Washington, then General of the Revolutionary Forces, remained at the house for the final year of the American Revolution, with 7,000 troops of the Continental Army encamped a few miles to the southwest. The house functioned as his longest-serving headquarters during the conflict. It was from here that the war came to a close with the issuing of the Proclamation of Peace. It wasn’t until 1961 that the house was designated a State Historic Site, and it was the first property acquired and preserved by any U.S. state for historical purpose. Also the oldest house in the city of Newburgh, it serves as a strong reminder of our nation’s past. The year that General George Washington spent at Newburgh might be most clearly associated with his victory of the British, but it was also here that Washington made some of the most enduring contributions to America. The Newburgh conspiracy, which sought military control of the government, was ended here, and, most importantly, the idea that Washington would serve as a constitutional monarch was quashed by the man himself. Created the Badge of Military Merit, which was the forerunner of the Purple Heart. Circulated a letter to influential State Governors that profoundly affected the writing of the Constitution. Newburgh residents feel privileged to have the site that played host to such dramatic events on their doorstep. For modern visitors, there’s even a Georgian Revival Museum building that offers a glimpse into the life of man himself and the times he lived through with the “Unpacked & Rediscovered: Selections from the Washington’s Headquarters’ Collection” exhibit. Since the site lies in such close proximity to the Newburgh Waterfront, visitors can finish their visit by taking a stroll along the river and eating in one of the area’s first-class restaurants. Few decisions have so strongly shaped our nation than those that were arrived at between the walls of Hasbrouck House. Any residents around Newburgh with an interest in revolutionary history won’t want to miss Washington’s Headquarters State Historic Site.